They say that soccer (futbol to the Spanish) is like a religion in Spain. It would be perhaps more accurate to say that religion is like soccer in Spain, such is the devotion expressed by the Spanish to their beloved sport. While once upon a time the essential Sunday activity was going to church in the morning, now it is watching the Sunday night fixtures. Spain has a great history of soccer, arguably only beaten by England and Italy in terms of footballing heritage. Real Madrid is the most successful soccer team in Europe, though their statistics are bumped up by being sponsored by General Franco during the 1950s. Soccer in Spain is inexpensive with tickets available for cheap at times from the clubs themselves. Realistically you should be looking to pay on average about 35€ to see a game unless you purchase tickets from a tout in the street. Of course for the bigger games, buying from a tout may be the only option. Spanish football is played in four professional leagues with promotion and relegation taking place at the end of each season. The season itself running between mid-September and mid-May. During this time each Saturday and Sunday sees over 100 professional games taking place across the country. Sitting atop the pyramid of leagues is the 20 teams in Liga A (known simply as La Liga in other European countries). Each team plays each other once at home and once away within a season. Real Madrid vs Barcelona - Twice a year Real Madrid and Barcelona go head to head in what is considered to be the best soccer games of the year (and certainly the most important). Added spice comes from the nationalistic Spain vs Catalunya element. The most national game of the year — bars from northwestern Galicia to southeastern Murcia will be watching this one. Sevilla vs Real Betis - Known as the Seville Derby. Both are well supported with average attendances of 50,000 plus so when these two come up against each other it is a party — win, lose, or draw. Deportivo de La Coruna vs Celta de Vigo - Known as the Galicia Derby. The main two teams from the northwest tip of Spain have a fierce rivalry. Normally a show of brute strength in which those wearing their hearts on their sleeves win through. Real Madrid vs Atletico Madrid - All-conquering Real Madrid are a magnet for the middle and upper-class Madrileños whereas its poor relation, Atletico Madrid, are followed more by the working man. Although not so common in recent years, an Atletico victory provokes wild celebrations throughout the city. 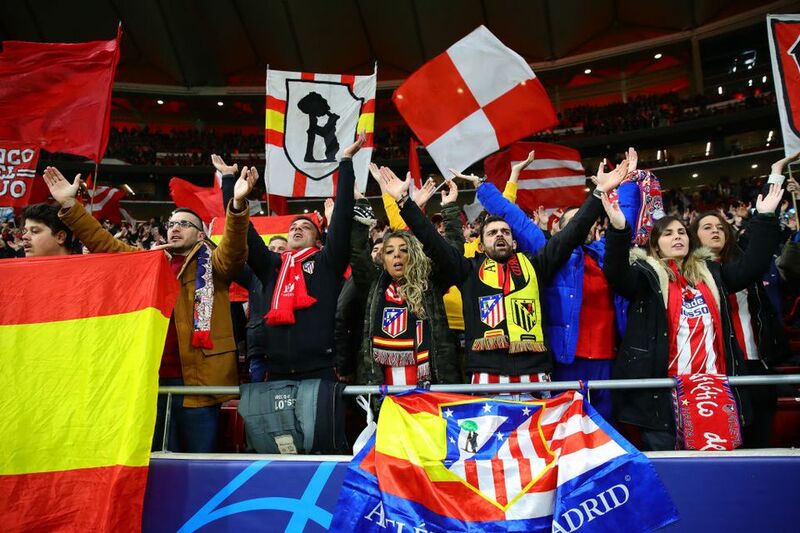 A defeat, on the other hand, is something the Atletico faithful have become used to and why they are known as the sufredores — the sufferers. If you do think of taking in a game, remember that the kick-off times are only published one week in advance after the television stations have had their picks. Bars showing the game will have the kick-off time published in the window, so you won't miss it. Barcelona players that have graced derbies of yesterday include 'Lobsterman' Pepe Samitier, who terrorized Madrid's defence in the 1920s, Ladislao Kubala, the Hungarian target man of the 1950s who was particularly fond of Barcelona's bars, and Johan Cruyff, the Dutchman who brought 'Total Football' and an inferno of cigarette smoke (he smoked 40 a day) to the Nou Camp in the 1970s. Michael Laudrup, Hristo Stoichkov, and Romario formed the so-called 'Dream Team' of the 1990s which was involved in some memorable tussles. More recently, Rivaldo, Ronaldinho, and, Lionel Messi have all inflicted irreparable damage to Madrid's title hopes in derby games. Madrid's most famous player was an Argentine called Alfredo Di Stefano who inspired five title triumphs in five years during the 50s and 60s. He was a great scourge of Barcelona, partly because they were deflected in their attempts to buy him. Ferenc Puskas, 'The Magical Magyar,' gave defenses of the 60s a torrid time. Emilio Butragueno was known as 'The Vulture.' He terrorized Barça in the 80s, as did the acrobatic Hugo Sanchez, in the late 80s - early 90s. In the past couple of decades Raùl, Zinedine Zidane, and Ronaldo formed a fearsome trio to take on Barça. From 1936 to 1975 there was, of course, General Franco, who as well as subjugating the Catalan region and outlawing the Catalan language, developed a deep suspicion for the Barcelona club, which was viewed as the epitome of anti-Spanish sentiment. During Franco's reign, Barça's followers developed a sense that referees and league officials were against the club, which partly continues until today. What was viewed as farcical decisions and exaggerated bans and fines against Barca were common. Real Madrid's players meanwhile had to unfairly carry the burden of being political representatives of the regime which favored it. Political and cultural differences caused mayhem at matches. Barcelona fans became so incensed by the referee's performance at one game in 1970 they threw 25,000 seats onto the field. In another, a Fascist soldier attempted to arrest the Barcelona groundsman on for being a suspected communist. And more recently a pig's head was tossed onto the field at the feet of Real Madrid player Luis Figo, who had betrayed Barca to sign for Real. Figo politely declined, having already eaten his dinner. If one player were to encapsulate the rivalry between Real Madrid and Barça than it would be Luis Figo. Figo spent five successful years at Barça in the late nineties, winning several league titles. He was the idol of the Nou Camp. Then in 2000, he decided to sign for Real Madrid. Overnight he became the most despised man in Barcelona and a Madrid icon. Though he went on to win several league titles with Madrid he also received perhaps the most hostile reception of any player in La Liga history when he returned to play in Barcelona. Among the indignities endured by the winger were the pig's head incident and a sea of banknotes in his name, meant to symbolize his greed as a pesetero — a money-grabbing turncoat. You'll find Spanish soccer teams in action up to four times a week during the soccer season, which runs from late August until May. Saturday - One La Liga game per week (the most important one available on free-to-air TV) is played on a Saturday. Sunday - The rest of the domestic games are played on a Sunday. Tuesday - 50 percent of all Champions League games (Europe's biggest cup competition) are played on a Tuesday. If a Spanish team is involved, it will be advertised in bars. Wednesday - The other half of Champions League games. Thursday - UEFA cup games. The UEFA cup is the secondary European cup, after the Champions League. Again, if Spanish teams are involved, it will be advertised. Bars in Barcelona have an international feel and usually show Premiership games, as well as La Liga. This is the case with Bar Salvador on Carrer Canvis Nous, close to Via Leyetana and Santa Maria del Mar Church, which has imported beers and also shows big rugby games. If you don't mind a predominantly English-speaking crowd, there are two huge traditional Irish bars in the center serving up sports events. These are Dunne's, on Via Layetana, and George Payne, in Plaça Urquinoana. Further out of the center, Michael Collins is a favorite for Catalans as well as ex-pats and is located within the shadow of La Sagrada Familia. Republic House, on Passeig de Sant Joan, also has a mixed local-ex-pat crowd, and will show pretty much any game you request. For a more native football crowd, head to one of the bars along Avenida Diagonal close to the Camp Nou Stadium — part of the noise you'll hear will come from the stadium itself. Or try any of the grease-splattered old men's bars you'll find on almost every block in the city. They're cheap, noisy, friendly, and very partisan. If you want to go to a local game and enjoy some free live football right in the city center, head to CF Barceloneta's stadium — which also has a very good bar with a huge screen — on Ronda Litoral. Here there are games all weekend, including those of an international league called the BIFL, which has teams from all over the world. This league has games at different stadiums around the city on Saturdays and a very lively social calendar. Also on Ronda Litoral, opposite Barceloneta metro station is Pasatapas, a tapas, and football institution, whose owner is an avid Espanyol fan. Madrid Tour with Visit to Real Madrid's Santiago Bernabeu Stadium - This package combines a guided tour of Madrid's main tourist spots with a look around Madrid's most hallowed soccer stadium. Santiago Bernabeu is home to Real Madrid, Europe's most successful soccer team of all time. Your tour will take you around the stadium, including the locker room, trophy room, and tunnel. Barcelona Sports Tour - If you're staying on this Costa Brava, this tour will pick you up from a number of tourist hotspots and take you to visit Barcelona's two most important sporting institutions — the Olympic stadium and Barcelona's Nou Camp stadium. You will also get some free time in the city to do some shopping.